Mikey Garcia is already talking about beating Adrien “The Problem” Broner in his upcoming fight next week. 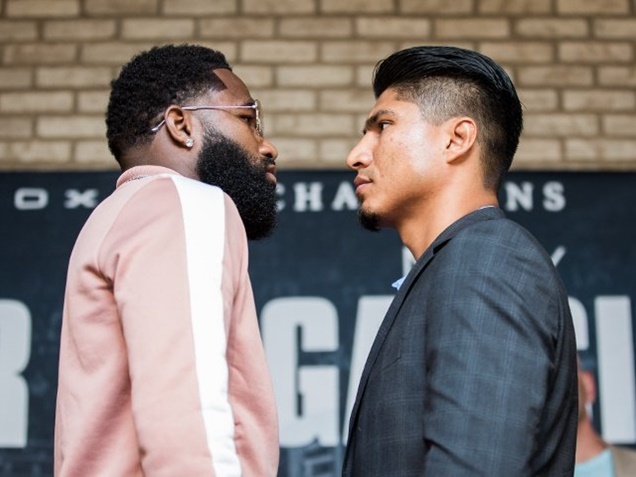 LatinoAthlete.com has learned that an overly confident Mikey Garcia (36-0, 30 KOs) believes that Adrien “The Problem” Broner is easy work. After his match with ‘The Problem,’ Mikey Garcia is planning on moving back down to the lightweight division to face WBA lightweight champion Jorge Linares, 31, (42-3, 27 KOs). The fight will be a unification fight. Garcia also has a back-up plan, just in case the Linares fight doesn’t come to fruition. He says that he would like to face off with lightweight champions; Terry Flanagan or Robert Easter Jr. – Those fights would also be unification fights. It seems odd that Mikey wants to go back down to lightweight to face obscure champions rather than staying at 140 and test himself. This comes off more like Mikey just wants to stack more wins in his belt and play it safe. Mikey should be going after fighters like Terence Crawford or Julius Indongo, instead of going back down. Could the 29-year-old Garcia be counting his chicken before they’re hatched? It’s almost like Garcia is jinxing himself if he loses against Adrien Broner (33-2, 24 KOs). Adrien is a very tough opponent with more size and big time experience against bigger fighters. If Garcia doesn’t play his cards right Adrien Broner will take him out by KO. Of course, Mikey Garcia’s brother/trainer Robert Garcia has been bragging that Mikey hits harder than guys like Marcos Maidana. True or not, Mikey should be humble about his upcoming fight. Broner is ready to attack, and after hearing how cocky Mikey, we kind of want Adrien to knock him out and give him some humble pie.